The current developments will come as no surprise to anyone who has visited China in recent years and has seen with their own eyes how quickly the country is developing. China’s major cities are growing at a very rapid pace, drawing in ever increasing numbers of Chinese citizens who are seeking education, work and prosperity. Construction work is everywhere to be seen: roads, bridges, industrial estates, office parks and giant apartment buildings by the dozen, frequently packed into a few square kilometers. Millions of Chinese citizens need to be supplied with energy and mobility, which has seen the consumption of energy generated using fossil fuels grow to such an extent that the impact on the environment in the large cities is increasingly evident. This is especially true of the air quality: smog and an ever-present haze which doesn’t let any sunlight through and which makes it almost impossible for people to breathe the air. The poor air quality in the cities is largely because most of China’s electricity continues to be generated in coal-fired power stations. Believe it or not, coal accounts for 93 percent of the energy generated using fossil fuels. In this context, huge quantities of carbon dioxide are being released which account for 80 percent of all the CO2 emissions in China, and with 10 billion tons, China is now responsible for 30 percent of the world’s emissions of CO2. By way of comparison, in Europe the current figure is approximately 4 billion tons . In 2013, 4,000 billion kilowatt hours of electricity were generated with coal, equivalent to around 80 percent of the total demand for electricity in China (5,245 billion kWh). For this reason, the use of renewable energy, especially solar and wind power, is playing an increasingly important role. China is now the biggest manufacturer of solar cells and solar accessories in the world. In 2014, however, the photovoltaic capacity in the country only amounted to 28 gigawatts. By way of comparison, according to the European Photovoltaic Industry Association, in Europe, 70 gigawatts of electricity were connected to the power grid in the year 2012. This is 69 percent of the world’s photovoltaic capacity. Wind energy currently only accounts for three percent of the electricity produced in China. This is equivalent to 180 bn. kilowatt hours with an installed capacity of 115 gigawatts. By way of comparison, the installed wind capacity in Europe totals approximately 129GW, of which 121GM are onshore and around 8GW are offshore. It isn’t just coal: traffic is also responsible for a major share of the air pollution in China. In 2014, 140 million vehicles were registered in China, the vast majority of which had conventional internal combustion engines. China currently manufactures 30 million vehicles per year. Half of the oil consumed in China is used in the transportation sector, with an accordant impact on CO2 emissions. Since the majority of the oil has to be imported (the import ratio totals 60%) and the impact on the environment has been so huge, the government has ordered that from 2020 onwards, new vehicles may only consume a maximum of five liters of fuel per 100 kilometers. For this reason, increasing numbers of electric vehicles can now be seen on China’s roads – especially in the cities. With 55,000 electric vehicles sold, China is already the second biggest market for E-vehicles. 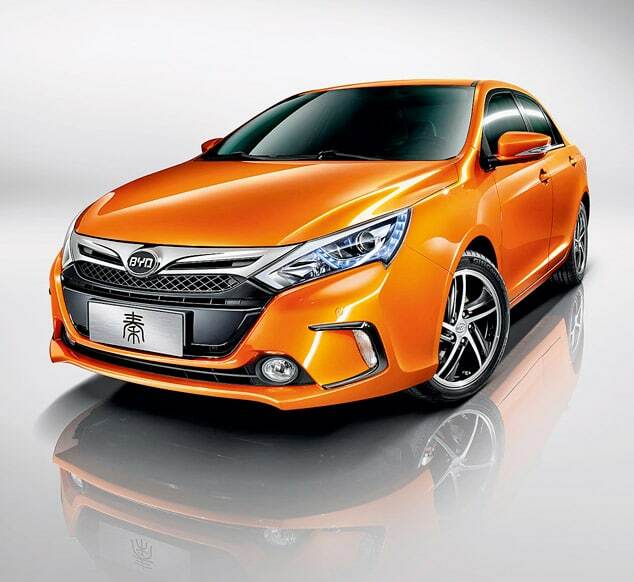 With 15,000 unit sales, the plug-in hybrid Qin which is manufactured by BYD is the fourth most widely sold E-vehicle in the world. All of the forecasts point to China becoming the biggest market in the world for electric vehicles this year. In 2015, more than 27,000 vehicles have been manufactured, with over 26,000 units having been sold in the first quarter. These are primarily battery-powered electric vehicles and plug-in hybrids. So far, electric vehicles powered by fuel cells have only been built and operated in the scope of demonstration projects. These demonstration projects are set to continue over the years to come, however. At the Olympic Games in 2008, 23 fuel cell buses hit the roads of Beijing. Two years later at the World Expo in Shanghai 2010, 173 fuel cell cars transported visitors and guests around the exhibition site over the course of six months. To supply the vehicles with fuel, four hydrogen filling stations were installed which were supplemented with several mobile filling systems, all with 350bar. From 2015 to 2019, the development and operation of a new demonstration fleet with 100 buses has been planned. They will be operated in at least four cities – with Beijing, Shanghai, Zhengzhou (Province of Henan) and Foshan (Province of Guandong) being confirmed participants. The use of E-cars is expressly encouraged and the topic of electric mobility is receiving considerable support from the central government. With a range of different rules and regulations, the Chinese government is intervening more strongly in terms of industrial policy and on the consumer side. In this context, in November 2014, the Chinese government launched its “Energy Development Strategy Action Plan” which is to continue until 2020. This sets the primary energy consumption for this period as being 4.8 bn. tons of coal equivalent. At the same time, the proportion of renewable energy in the overall primary energy mix is to increase to 15 percent by the year 2020. Furthermore, 20 key areas for energy innovations have also been defined in this action plan. Hydrogen and fuel cell technologies are playing an important role in this area. In April 2015, the “Financial Support Policy for New Energy Vehicles 2016–2020” was published jointly by the following ministries: MoF (Finance), MoST (Science), MIIT (Industry and Information), and also the NDRC (National Development and Reform Commission). These funding guidelines specify that in the years 2017 and 2018, the subsidies for battery-powered and plug-in hybrid vehicles will be reduced by 20 percent, and in the years 2019 to 2020, by a further 40 percent– in both cases compared with the year 2016. Vehicles that run with fuel cells are exempt from this regulation, and the funding standards for these types of “New Energy Vehicles” will remain unchanged. Furthermore, the tax exemption regulation for “New Energy Vehicles” which has been valid since 2012 has also been renewed by the MOF, the MIIT and the tax authorities. According to this regulation, battery-powered cars, plug-in hybrids and electric vehicles powered with fuel cells are tax-free. To increase the number of buses in use in the urban transportation systems, the fuel subsidies offered to major cities are to be gradually reduced until 2019. At the moment, the central government pays for the fuel used in the buses that operate in the public transport networks in the large cities. The worlds of science, industry and politics are working hard to develop the international collaboration in the area of hydrogen and fuel cell technologies in particular. In this regard, China was recently the host of the 32nd Steering Committee Meeting of the IPHE (International Partnership for Hydrogen and Fuel Cells in the Economy). In Wuhan, a metropolis situated in central China, representatives of the 18 member countries convened to discuss the latest developments in the area of H2 & FC over the course of a range of different events.